Fibers have been used to reinforce brittle materials from time immemorial, dating back to the Egyptian and Babylonian eras, if not earlier. Straws were used to reinforce sun-baked bricks and mud-hut walls, horse hair was used to reinforce plaster, and asbestos ﬁbers have been used to reinforce Portland cement mortars. Research in the late 1950s and early 1960s by Romualdi and Batson (1963) and Romualdi and Mandel (1964) on closely spaced random ﬁbers, primarily steel ﬁbers, heralded the era of using the ﬁber composite concretes we know today. In addition, Shah and Rangan (1971), Swamy (1975), and several other researchers in the United States, United Kingdom, Japan, and Russia embarked on extensive inves- tigations in this area, exploring other ﬁbers in addition to steel. By the 1960s, steel-ﬁber concrete began to be used in pavements, in particular. Other developments using bundled ﬁberglass as the main composite reinforcement in concrete beams and slabs were introduced by Nawy et al. (1971) and Nawy and Neuwerth (1977), as discussed in Section 22.8 of this chapter. 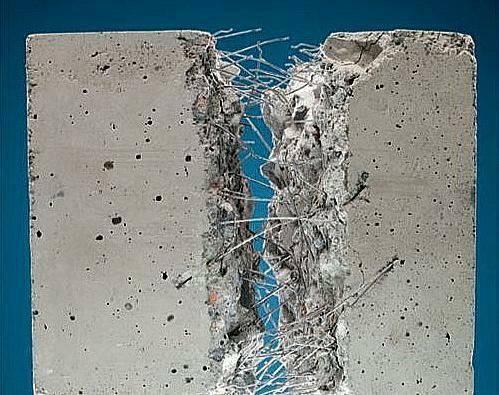 From the 1970s to the present, the use of steel ﬁbers has been well established as a complementary reinforcement to increase cracking resistance, ﬂexural and shear strength, and impact resistance of reinforced concrete elements both in situ cast and precast. Summary The concretes described in this chapter have demonstrated that the strength, ductility, and performance of concretes and cement-based composites have and will continue to achieve higher plateaus. A new era in construction materials technology has commenced that promises to have a revolutionary impact on constructed systems in the 21st century.